There are many fancy and extravagant Korean course meals throughout Seoul but it's surprisingly difficult to find places that do so while doing the food justice. This is particularly true in many of the "modern" or "fusion"-emphasizing Korean course meal places which relies more on gimmicky ingredients and leaving out the soul and essence of the Korean dish itself. Someone I know recently had a birthday and invited us to Baekkop which I'm introducing in this post today. Baekkop is a funny name for a Korean course restaurant as baekkop (배꼽) means "belly button" in Korean. The setting paper has a lengthy explanation about how a belly button is the remnant of the connection between child and mother and also some funky mythology about how the belly button is a small cosmos in itself and saying how they want diners to feel his or her own small cosmos during the dining experience. Sure, I thought as I read the description, but how about them food? The setting of the restaurant itself is a rather modern restaurant with many private rooms that can be booked. It doesn't have "traditional" Korean feel to it (with the hanok and hanji and everything) which many such Korean restaurants have and baekkop rather feels like a modern style Chinese restaurant with its sleek tables and wooden walls. A number of different course options are available here ranging between 19,000 ~ 45,000 won per person. The latter will include extras in the delicacies department such as hwoe (sashimi), roasted eel, hanwoo (Korean beef), etc. Baekkop puts an emphasis on in-season ingredients and makes everything to order. The jeon, for example, came piping hot from the pan which showed they weren't made ahead of time and reheated for the table. Things like rice, water kimchi, porridge, etc are served in individual portions while the main dishes all come with a pair of serving chopsticks/spoon for diners to help themselves. While groups sit together on one large table, the table is actually comprised of smaller tables which seat either two or four people. They are very finicky about knowing how many sit at each of these smaller tables as they make all the main dishes according to the number of patrons sitting at each table. So make sure your group arrives in a timely fashion or, if you know ahead a number of individuals will be coming late, seat them together at a smaller table at the end and have the restaurant serve them together later. Things started off with a simple nokdoo jook (녹두죽 or mung bean porridge) for each individual. Very mellow and smooth, if there were any sugar or salt added to the cooking process it was kept at a bare minimum. The creamy porridge was a good way to start off your empty stomach on a light way before the onslaught of food. A salad of simple greens, sprouts, lotus roots, almonds and such followed. I would've preferred some darker greens or a little more variety in vegetables for a course meal but the dressing was fantastic. Made with ground fruit such as apples and pineapples, it had the perfect balance between natural sweetness, tartness and creaminess that kept the salad light. Individual cold water kimchi (mool kimchi or 물김치) was brought out to enjoy in between the main dishes and act as a nice palate cleanser. The smokes salmon rolls came wrapped in thin radish with a sweet creamy dressing and sprouts or fried potato shavings on top. This was ok but I didn't really see or taste the smoked salmon. The plate was awkwardly large for the portion. Perhaps the dish I was least impressed with. Sora muchim (소라무침) and leaves for wrapping. Sora, or conch snails, are tossed and mixed with vegetables in a spicy sweet red pepper paste, vinegar, sugar-based dressing. Take a bit of the tossed sora and veggies and place on a leaf and eat in one bite. The sora muchim was delicious with the sora having a pleasant chew to the crunchy vegetables. I'm not sure wrapping it in the leaves provided anything particularly extra in flavor or texture but I love eating things in wraps so no harm done. The jeons came next in fish and a mixed vegetable variety. The jeon were hot from the pan and aside from the nuisance of picking out the bones from the fish jeon and the too-little amount of dipping sauce provided on the side, perfectly fine. Then came individual serving bowls of dried pollack soup (boogeoguk 북어국). With watercress, radishes, soybean sprouts, and more, the broth was refreshing to take in as another "break point" before taking in the next round of food. A dish of mung bean jelly (tang pyeong chae or 탕평채) followed. It was tossed simply with sesame oil, a bit of salt, toasted seaweed bits and topped with cooked shiitake mushroom slices, egg slices, and a few bits of green. This was also a dish that was all right but hardly memorable. Some may even find the dish bland. A dish of thin beef fried with sweet rice powder followed accompanied by a yuza dressing sauce (소고기찹쌀구이). I loved the yuza dressing here which held well against the flavors of beef as well as the veggie mixture we were instructed to wrap the thin beef with. I felt there was a bit of excess sweet rice powder on the beef which gave it a rather powdery texture than a crispy one though. A very unique dish came next called ddeok jabchae (떡잡채). Instead of using glass noodles, strips of rice cakes were used while mussels made an unusual but well paired appearance here. The dish had a spicy kick to it that reminded me of the flavors of a Chinese-Korean dish like jjambbong. In either case, the chewy rice cake strips, the crunchy veggies, and the spicy/savory flavors came together superbly and the dish was a big hit with everyone. Very unique and very memorable! Gwangyang Bulgogi (광양불고기). Also a hit with the group. Despite the dry look, it was surprisingly moist and seasoned light which made it pair well with the side greens as a sort of wrap deconstructed. It was very quickly gobbled up. Braised pollack (코다리). The light sweet and tart sauce didn't overpower the pollack's meat while the onion, chives and carrot sticks on top provided fragrance and texture. It was a nice lighter dish to follow the heavier bulgogi dish before. And lastly, before the rice and stew course, came the battered and fried shrimp. The panko breading was perfect and the shrimp was not overly greasy. I was just a little puzzled by the tartar-like sauce that came on top which was most definitely not a Korean dish. Since Baekkop is a semi-fusion place, I guess it's understandable but it was such a random curve ball thrown in that I couldn't help but feel it out of place in the course. It was, however, perfectly tasty. A Korean course meal always ends with rice, or noodles at the least, and Baekkop is no exception. The side dishes are always seasonal and changes. On my visit, the side dishes included dried radish strips, mung bean sprouts, fernbrake or gosari (고사리), braised small potatoes, stir fried anchovies, and bireum namul (비름나물) or amaranthus. All this came with a side for rice and a bowl of dwenjang jjigae. By this time I was so fully stuffed I wasn't even able to finish all my rice. However, everything from the fried halibut to side dishes were delicious. The dwenjang jjigae and braised cabbage were fine but not particularly memorable which was somewhat disappointing as I think a star menu item for a Korean course meal place should be your dwenjang jjigae. Interestingly, the after meal drinks was a pumpkin sikhye (식혜) which had all the sweet flavors of a regular sikhye but a clear and mellow pumpkin flavor and fragrance. I'm not a fan of sikhye in general but the pumpkin overtones was so fascinating I ended up drinking the whole thing. Baekkop had its hits and misses like any other restaurant but overall I left satisfied and full. Baekkop is not a traditional course Korean meal as it mixes some elements and ingredients that are less common in Korean cooking but it's definitely not lost out there in the "culturally lost" fusion category. Make no mistake, Baekkop is still firmly based and prides in its Korean culinary roots but it also makes an occasional tweak here and there to throw a few unexpected curve balls- even if the curve balls sometimes doesn't work. Still, the food was fine and prices reasonable so if you're in the area and looking to entertain, it's certainly worth a gander. 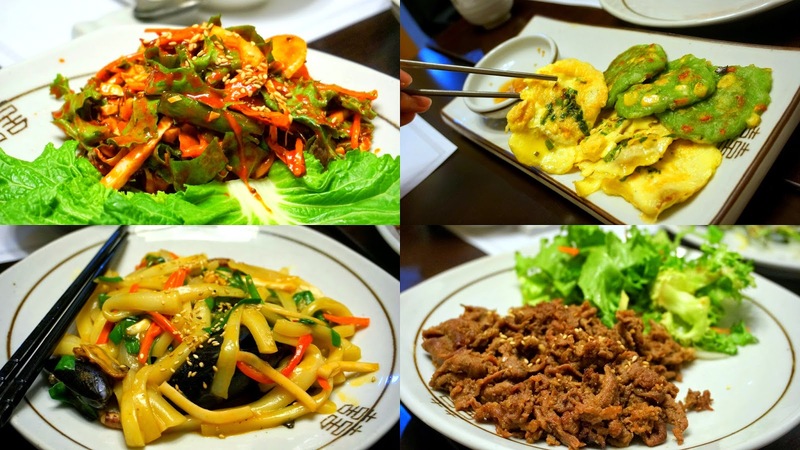 The dishes are hits or misses but Baekkop is reasonably valued for a decent Korean course meal. 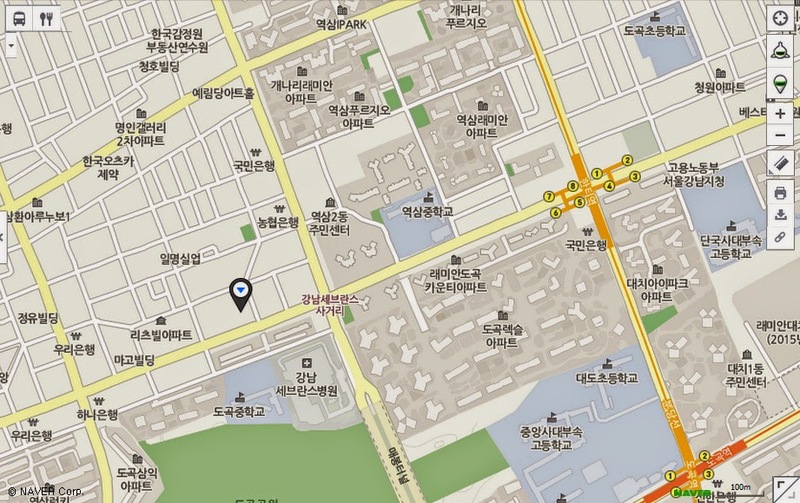 Come out of Hanti station, exit 7 and walk straight for about 600 meters (past the Gangnam Severance Hospital intersection). Baekkop will appear on your right. Your standard Korean soju, beer, makgeolli and such all available. The main branch location is in Sungnam's Soojeong neighborhood which I've read has a more aesthetically pleasing interior and exterior. Course menu is made to order according to the number of your party so make sure your group is on time. They may refuse to start cooking and bringing out food if all your party members aren't there!